The random placement of an advertisement results in an amusing and revealing irony. This NFL season, Nationwide has jumped on the Peyton-Manning-advertising bandwagon by annoying us with several different Manning-delivered versions of their jingle including: “50 Omaha set hut,” “Chicken Parm you taste so good,” and “Nothing beats that new car smell.” The commercial is effective in that it remains stuck in your head in the same way Mastercard’s “Cut that Meat” did years earlier. Plus, it makes Nationwide cool and hip, right? Wrong. 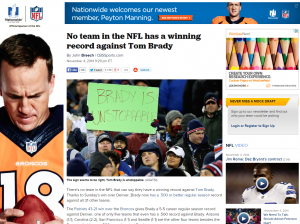 By making Manning their spokesperson, Nationwide is buying into the same faulty notion that somehow creates shock and awe every time Manning comes up short in a big game–that a nonfiction narrative can be created rather than observed. For over a decade, the sports media has tried to convince us that Peyton Manning is the professional football player to admire. His obsessive need to control all the details pre-game and pre-snap (and sometimes post-snap) is to be seen as a strength, not a weakness. His Super-Bowl-ending-interception and big-game-absences are to be seen as tragedies, not shortcomings. It doesn’t matter what he’s done or what he does, the story has remained and will remain the same, probably until any of us are long gone: Peyton Manning is the greatest quarterback to ever play professional football. Except he’s not. Tom Brady is, and it’s not even me as a New England Patriots fan who’s saying it. Reality is. Except the sign isn’t right. Brady isn’t unstoppable. As a Patriots fan, I’m well aware of many losses he’s suffered. No one can win them all, not even Brady. It just seems like he can because we’re continually told over and over again that he can’t. Likewise, by inundating us with the idea of Manning’s greatness, the tellers of that tale created this delicious bit of unintentional irony that Daniel stumbled upon. 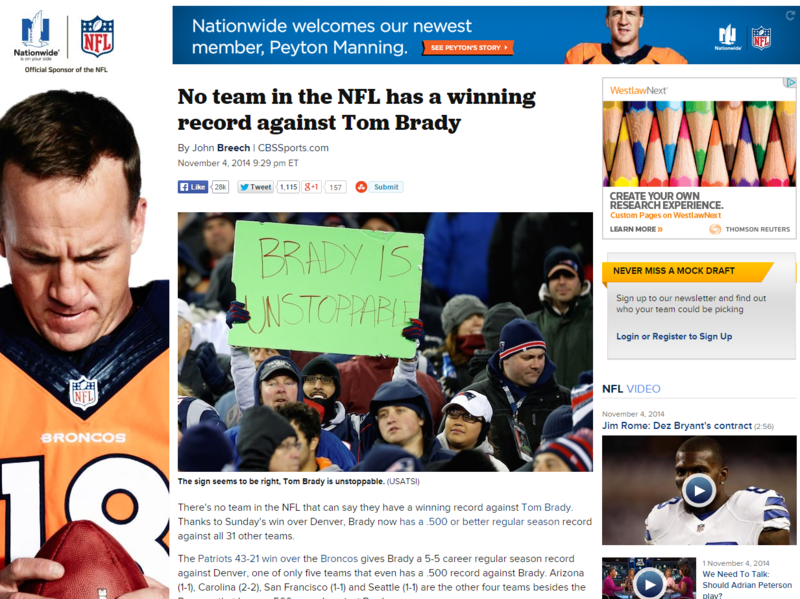 The ad appearing next to the story is only funny because the supposedly unstoppable quarterback was stopped by the supposedly stoppable one. It’s a weird counter-intuitive mess that will hopefully give anyone with a brain pause. If the nonfiction narratives we craft contradict reality, they will unravel and turn into joke–and the people who unwittingly buy into them will be a part of the punchline.